Today marks the 33rd anniversary of the EDSA People Power uprising, when millions of people took to the streets in the Philippines and toppled the Marcos dictatorship. Under the Duterte regime, we see many of the same oppressive conditions: politically motivated killings and arrests, attacks on the freedom of the press, aerial bombings of Moro and indigenous communities, martial law in Mindanao, land theft for foreign interests, government corruption, and occupation of Philippine land and seas by the U.S. and China. But just as we did in 1986, the Filipino people are standing up, fighting back, and ready to take down this dictatorship in 2019! Every February 14th, marks an international mobilization for women across the world: One Billion Rising- a global campaign to raise awareness and demand a stop to violence against women and children. Women human rights defenders, workers, students, urban poor, indigenous peoples, and individuals from different organizations and institutions gather to denounce violence against women and to show solidarity throughout the world. “Abuse and violence on women does not stop inside their homes; more intense forms of violence are sponsored and perpetrated by the state. We have witnessed in the last two years of the Duterte regime an accelerating increase in poverty and state instigated violence. Each day we hear and see women and children being victims of extrajudicial killings since the start of Oplan Tokhang” or better known as the Drug War. At the beginning of the year the House and Senate approved of a bill that would lower the minimum age of criminal responsibility from 15 years old to 12 years old, with the House originally passing their bill to lower the age to 9 years old but amended this due to protests and pressure from the public and advocacy groups. Congress has yet to fail or pass this measure which will resume session post midterm elections in May. Philippine jails have become increasingly packed under Duterte’s Drug War, combined with the arrests of political activists and human rights defenders, ranking among the most overcrowded prisons in the world. On January 15th, there was one victory for the people – the recent release of National Democratic Front peace consultant Rafael Baylosis nearly a year after his illegal arrest. The court dismissed the false charges ruling that the search and arrest conducted by the police were illegal in the first place. However, NDFP consultant and Philippine Peace Center Executive Director Rey Casambre and his wife Cora are still detained along with the 540 other political prisoners, 203 of which were arrested under President Duterte. This week, on Feb 10th an alert was released by the Rural Missionaries of the Philippines and human rights workers initiating a fact finding and rescue efforts for the release of two human rights advocates Gloria Jandayan and Gleceria Balangiao, mother and daughter being detained at 1st Special Forces Battalion camp in Manolo Fortich town, Mindanao. Their arrest adds to the long list of cases of human rights violations against Gabriela Women’s Partylist and Makabayan volunteers on the eve of the electoral campaign period before the midterm elections which will definitely result in heightened attacks against human rights defenders. They have yet to be released. Nearly 10% of political prisoners are women. One Billion Rising’s call is to RISE! RESIST! & UNITE! GABRIELA USA’s adaptation is to Rise Against Duterte! Resist Militarization! & Unite for Genuine Liberation! 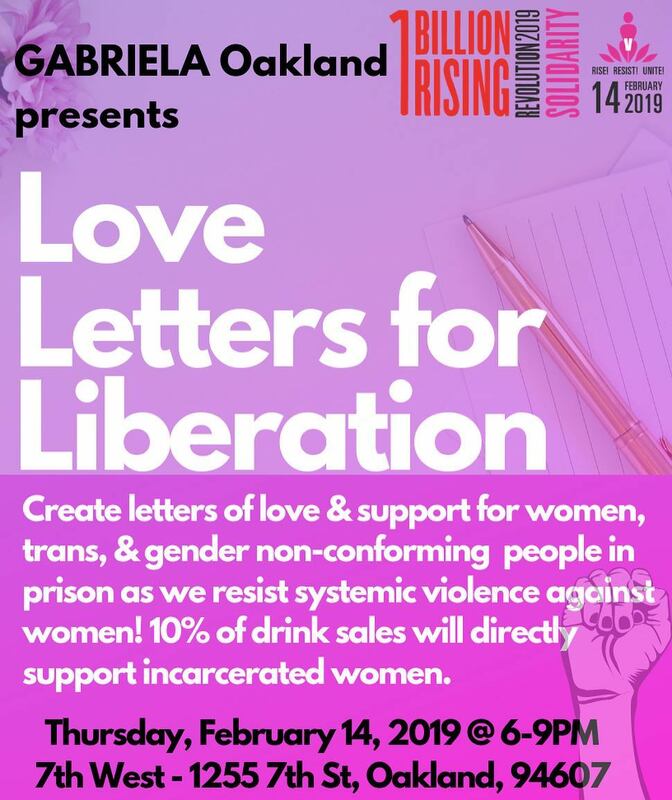 JOIN GABRIELA OAKLAND TODAY at their “Love Letters for Liberation” event to create letters of love and support for women, trans & gender-non conforming people in prison. 6-9pm @7th West 1255 7th street Oakland For more information on this event and the upcoming International Working Women’s day March follow @Gabriela Oakland on Facebook and Instagram. February 4, 2019 marks the 120th anniversary of the Philippine-American War. Though history books will tell you that this war ended in 1902, and “independence” was given to the Philippines in 1946, our National Democratic movement recognizes that the fight for genuine independence for the Philippines continues to this day. The fascist Duterte regime has allowed both the United States and China to trample on Philippine national sovereignty. In 2018 alone, the United States provided 184.5 million dollars in aid to the military and police, supporting Duterte’s terrorism in the 3rd extension of martial law in Mindanao as well as the notorious Drug War which has killed up to 27,000 people according to the Commission on Human Rights. The U.S.’s “counter-terror” Operation Pacific Eagle increases its own deployment of U.S. military to the Philippines primarily for aerial intelligence, surveillance, and reconnaissance support. China has also pledged P24 billion in aid and investment, $332.9 million dollars in “rebuilding” Marawi city, and P370 million in military aid. China has illegally built man-made islands to claim disputed islands in the Spratly Islands and South China Sea, despite the United Nations tribunal ruling in favor of the Philippines in the sea dispute. The U.S.-Duterte regime is combining the worst of each of his predecessors into his one man show: the corrupt cronyism and family dynastic behavior, the rise of impunity of the military and police, the fascist and violent attacks on communities, and the tactic of maintaining power through the rule of fear, subjugation, and manipulation. 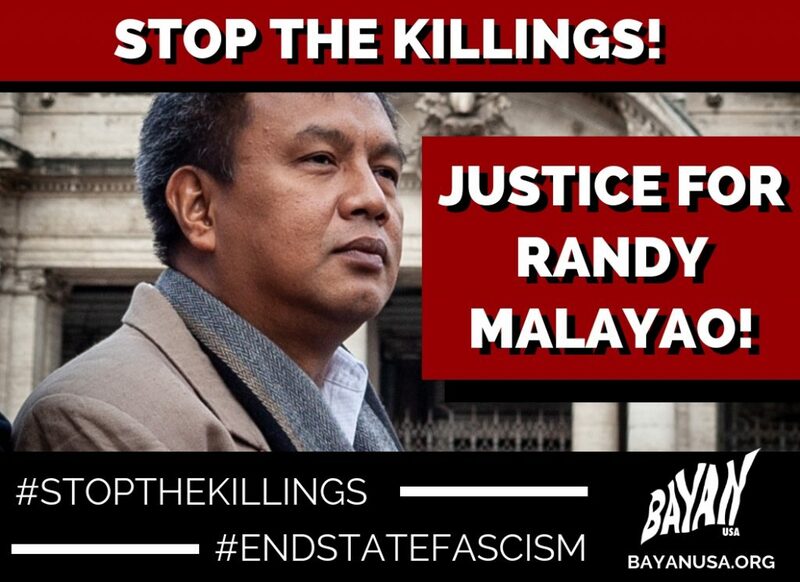 With the recent murder of National Democratic Front of the Philippines peace consultant Randy Malayao, people are taking action to condemn the rising violent fascist attacks and extrajudicial killings, and to struggle for lasting freedom and genuine democracy. Join us in the events and actions listed below! We call on everyone who supports the fight for Philippine Sovereignty to join BAYAN USA’s Philippine Solidarity Week of Action! Never Again to Fascist Dictatorship! Join Actions & Events in your area or plan an action! You can print these SIGNS! FEB 5th 5pm-7pm JERSEY CITY, NJ – Vigil for Randy Malayao & All Victims of Duterte’s War Against the People, Journal Square Plaza. FEB 8th 6:30pm-9:30pm NEW YORK, NY – From Puerto Rico to the Philippines: Solidarity as Resistance, 39 Eldridge St. 4th Floor. FEB 10th 6pm-8pm SAN JOSE, CA – Educational Discussion on Philippine Peace Talks, CASER, and the Political Repression Under Duterte, 48 South 7th St.
FEB 11th 6pm-9pm JERSEY CITY, NJ – Educational Discussion on the Philippine American War, 125 Glenwood Ave.
FEB 11th 6pm-9pm OAKLAND, CA – What is the Untold Legacy of the Buffalo Soldier: Building Inter’l Solidarity Movement to Fight Fascism and U.S. Imperialism in the Philippines, Bandung Books 2277 International Blvd. Write a Solidarity Message supporting Genuine Philippine Independence & National Sovereignty (short video, short written statement- these can be emailed to secgen@bayanusa.org) These will also be uploaded to our Facebook page.